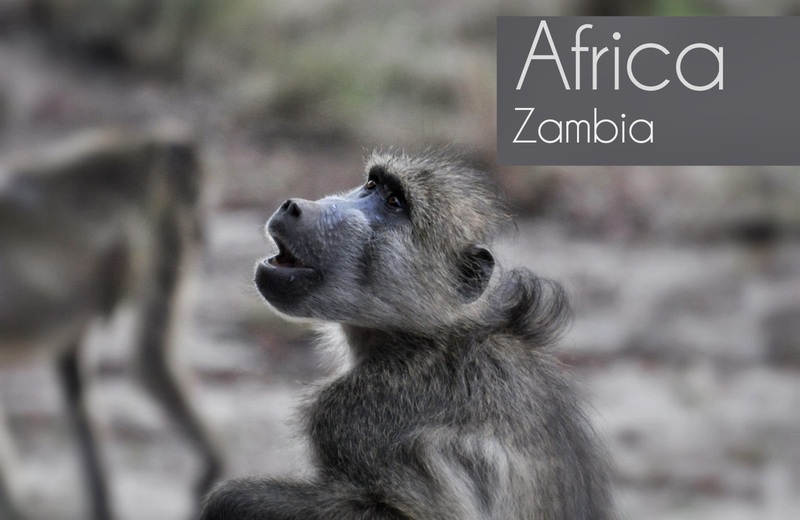 We disembarked the plane in Livingstone, Zambia, and were immediately whisked to our hotel , the Tongabezi Safari Lodge, which was a luxurious cabana located on an island in the middle of the Zambezi River. Each of the five cabanas are nicely secluded; guests walk down to a main porch for al fresco meals. It was the coolest place I’ve ever stayed. At night you could hear the hippos walking through the underbrush and elephants trumpeting as they went down to the river for a bath. We snagged the ‘honeymoon’ cabana and each night they’d fill that bath with steaming hot water and set out a bottle of champagne. Decadent! Like many borders, a river is the defining line between countries. 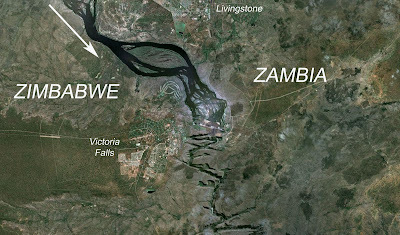 In southern africa, the great Zambezi River forms the border between Zambia and Zimbabwe. 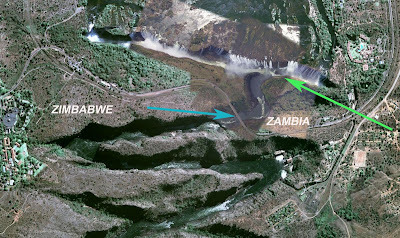 The river is flowing to the south-southeast although it takes a crazy jog to the northeast before finally emptying into the Indian Ocean in central Mozambique. The surrounding land is flat, thanks to a relatively level basaltic bedrock foundation. The river meanders slowly across the land. Until it reaches a massive zigzag seam in the basalt. And then it becomes vertical. Thus is born the famous Victoria Falls (also called Mosi-oa-Tunya [the Mist that Thunders] ), one of the seven natural wonders of the world. 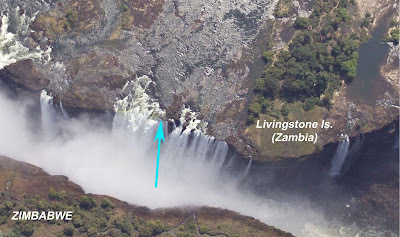 Named by the missionary and explorer David Livingstone in 1855 for Queen Victoria, it was formed when the Zambezi River encountered a transverse fault (of soft sandstone composition) in the basalt bedrock. Although neither the longest or tallest falls in the world, many claim it to be the largest, based on both height (360 feet) and length (5,600 feet). Numbers aside, it is dramatic, to say the least. "Creeping with awe to the verge, I peered down into a large rent which had been made from bank to bank of the broad Zambezi, and saw that a stream of a thousand yards broad leaped down a hundred feet and then became suddenly compressed into a space of fifteen to twenty yards....the most wonderful sight I had witnessed in Africa." "No one can imagine the beauty of the view from anything witnessed in England. It had never been seen before by European eyes, but scenes so lovely must have been gazed upon by angels in their flight"
Taking a closer look at the falls, one can clearly see the areas where the river has carved away the sandstone, leaving the basaltic matter relatively intact. For scale, the northern-most gorge (green arrow) is approximately a mile in length. Due to the rather ugly political conflict that Zimbabwe is experiencing, we elected to stay on the Zambia side. The most entertaining activity we did in the vicinity of Victoria Falls was to take a short boat trip to Livingstone Island, on the very edge of the falls. After a nice stroll and look-see on the island, we swam (yes, swam!!) along the very edge of the falls to a rocky outcrop in the very center of the deluge (blue arrow). That rock ledge forms a small pool into which you can jump. It’s called, appropriately enough, the Devil’s Pool. It was crazy fun. That dude in the blue is approximately six inches away from a very long, definitely fatal descent. The main thought running through my head during the entire outing: "My God, they would NEVER allow this in the US!” The liability insurance would be crippling. Definitely a fun outing. It helps to be a confident swimmer for this trip. A few gals weren't sure they could make it across the river; they ended up clinging to the backs of the guides as they made a mad paddle for the safety of the rocks. After our jaunt through the river, we met up with our safari peeps and turned to wildlife watching full time. On a river boat ride upriver of Victoria Falls..
FYI: an interesting (and not too technical) read about baboons (and other animals) is Stanford's Robert Sapolsky's book called Why Zebras Don't Get Ulcers. One thing to add to your bucket list: an African sunset. It looks like you had a great time. Wonderful pictures!!! !